Sotheby's Broker Andrew Ernemann, back left, and Randy Gold, of Aspen Appraisal Group, talk about the state of the Aspen real estate market Wednesday during the Board of Realtors annual market overview. What goes up in real estate must come down, and the longest-running upward trend in sales and appreciation in 40 years of real estate history in the Aspen market has been six years. 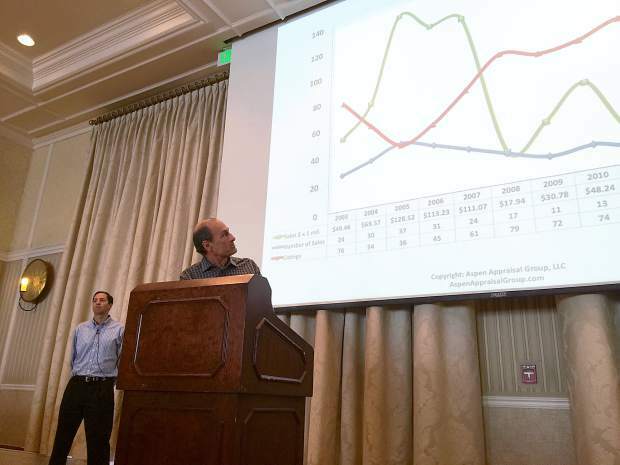 Last year was the fifth year of an “up market,” Aspen Appraisal Group’s Randy Gold said Wednesday at the Aspen Board of Realtors 2015-16 Market Overview luncheon at the Hotel Jerome. Roughly 150 real estate industry professionals and community members attended the event. Gold paired up with Sotheby’s Broker Andrew Ernemann for an optimistic presentation of the state of the Aspen real estate market. They touted signs of strength that haven’t been seen since pre-recession days, such as 2015 potentially being the first year in more than a decade when prospective buyers outnumber listings. There are 15 percent more high-end listings compared to a year ago in the $5 million to $10 million range, Gold said, while the supply of $10 million-plus and $20 million-plus listings is about the same as last year — large. “This part of the market is still very over-supplied with five-plus years of inventory,” Gold said. He predicted three to five sales in that ultra-high-end market over $20 million this year, noting three Aspen closings already in the first 40 days of 2015 over $10 million, with three more under contract — including one fore more than $20 million. With condominiums in Aspen, the number of sales is just now exceeding the number of listings, Ernemann said, noting the last time that happened was in 2003-04. But there’s pressure in Aspen against brand-new construction, penthouses and large townhouses that’s pushing prices up, he said, but that also adds to the buzz of where the market is and where it’s going, Ernemann said. There were eight condominium sales in 2014 at more than $2,000 per square foot in the Aspen core, he said, as well as the first-ever sale at more than $3,000 per square foot — the Muse Building penthouse for $15.8 million at $3,100 per square foot. Ernemann compared Aspen with places such as Manhattan, London and European ski resorts where $3,000, $4,000 and even $5,000 per-square-foot price tags are common for condos, predicting that Aspen should start to see $3,000-per-square-foot price tags become more commonplace. Another positive market trend in 2014 were land sales. Gold noted that land sales look like they could follow the same trend seen with Aspen condos where sales outpace listings. Seeing land move at such a high pace and value signals what’s to come in other segments of the market, specifically single-family, he said. On the commercial side of things, Gold spoke at length about developer Mark Hunt as well as the four other largest commercial real estate owners in Aspen: Stephen Marcus, M&W Properties (Tony Mazza and Frank Woods), Garfield and Hecht (Andy Hecht and Ron Garfield) and the Meyer family. Collectively, those five own roughly 40 to 45 percent of Aspen core’s commercial real estate, Gold said. What those owners plan to do with those properties is especially noteworthy given the fact the Bert Myrin appears to have succeeded in getting a variance-control question added to the May ballot. That means there could be a rush of applications, he predicts, from developers hoping for exemption through entering the process before the election. According to Gold and Ernemann’s data, the clock also is ticking for the market as a whole. The upward trend in the market could last longer than the historical six-year high due to rebounding from the greatest recession since the Great Depression, but they’re certain the upward movement can’t last forever. It’s especially concerning for the Snowmass market, they said, because it’s growth lags two to three years behind Aspen’s, although it typically falls simultaneously.